David Conway leads a quiet life in picturesque Magenta Bay on the colony world of Chalcedony. Nothing much has happened for five years, but all that is about to change. First he meets the mysterious holo star Carlotta Chakravorti-Luna, who regrets the lost loves of her past and dreams of learning what the future might hold. Then Conway's alien friend Kee heads inland to take part in an Ashentay ritual with potentially fatal consequences. What follows is a convoluted and poignant tragedy which entangles Conway and his friends. In Starship Fall, Eric Brown has crafted a powerful, moving novella about love, friendship, and the consequences of learning one's destiny. 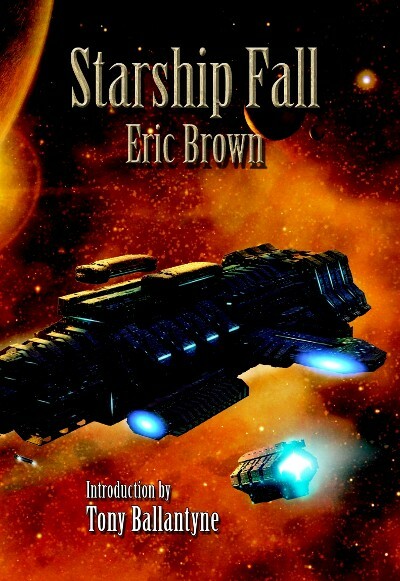 Starship Fall is a stand-alone tale featuring the same group of characters introduced in Eric Brown’s British Fantasy Award shortlisted novella Starship Summer (PS Publishing, 2007). Pete Crowther of PS was very keen to publish this book but PS are already committed to producing a novella from Eric this year – Gilbert and Edgar on Mars – and could not fit a second such into their schedule. Their misfortune is our gain, and NewCon Press are proud to present this outstanding tale as the first in our new series of novellas. Traditional SF in style, yet wholly original in concept.